Steve Glanzmann has been living and working in the Philadelphia vicinity since birth. While studying Architecture at Spring Garden College, he finished his first symphony and began writing many more works. In 1987, Steve began studying Music Education at Penn State University. While there, he became Manager/Librarian for the PSU Wind Ensemble. Steve’s senior courses were concentrated in Jazz Studies. He graduated from Penn State University with a BA in Integrative Arts., and later attended West Chester University for graduate studies in Music Theory. Between 1990 and 1993, Steve worked for T. Presser Company’s Rental Music Dept., during which time he was librarian for the Bucks County Symphony. In 1994, Steve began working for J.W. Pepper as a tele-communicator. From 1995 to 1999, he worked in Pepper’s EAM Dept. handling whole-sales, as well as some rental and licensing issues for European American Music. While working for J.W. Pepper’s EAM Dept., Steve began part-time work in The Philadelphia Orchestra Library in September 1996 and continued until May 2001. In 2002, while still continuing graduate studies in WSU’s Music Theory program, Steve briefly worked for the Curtis Institute of Music’s Milton Rock Resource Center. In January 2003, Steve was hired as a full-time librarian for The Philadelphia Orchestra. Since The PO’s 2007-08 Season, Steve has presented many pre-concerts discussions. Steve regularly plays trumpet for community theatres, high school musicals, and local big bands. He maintains a trumpet and music theory studio teaching young musicians. 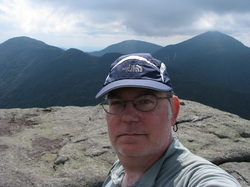 Since 1990, he has hiked nearly all of the Adirondack’s 46 High Peaks, and much of the Appalachian Trail in Pennsylvania. In addition, Steve loves visiting museums and amusement parks with his wife and children.